Apple’s iPhone 6 and iPhone 6 Plus smartphones are chewing away at Samsung’s market share in Korea, according to new research published by Counterpoint on Wednesday. The firm said that Apple sold more than 20 million iPhones globally during the month of November, up 26 percent from November 2013. The stat lines up nicely with other analyst reports that suggest Apple will report record iPhone sales during its fiscal Q1, or calendar Q4; the earnings report is due out next week. Counterpoint said demand for the Apple’s new iPhones was greater than expected in China, Japan and Korea, and that Apple’s market share hit “record levels” in the latter two markets during November. Apple’s share in Korea, Samsung’s home market, increased to 33 percent during the month, while Samsung and LG both saw market share decreases to 46 percent and 14 percent, respectively. Counterpoint attributed the increase in screen sizes for both phones to the success, largely because Korea is the “world’s highest penetrated phablet market” that “earnestly needed a large screen iPhone for quite a time and now this thirst has been quenched.” Apple’s market share in Korea may have even topped 40 percent, digging deeper into Samsung’s home territory, had Apple had enough supply to fulfill orders, Counterpoint suggested. 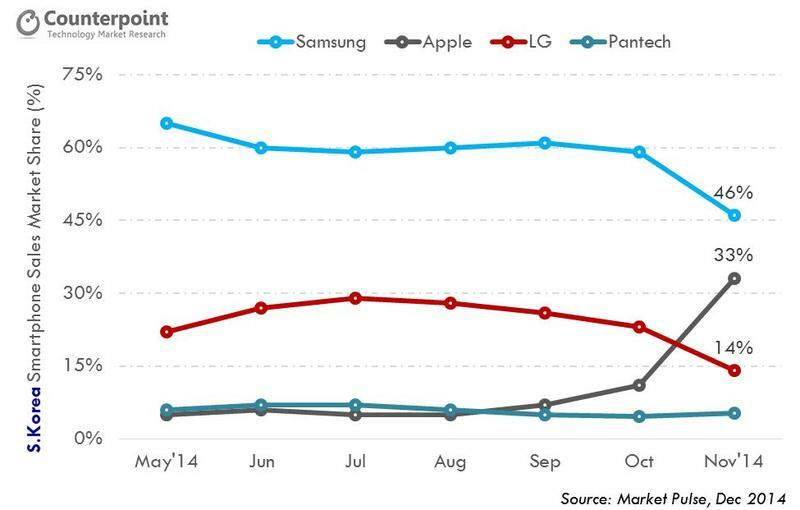 Counterpoint said Apple’s success expanded to other markets as well. In China, the iPhone 6 and iPhone 6 Plus helped propel the firm’s grip to a 12 percent market share. Counterpoint also estimates that Apple sold nearly 1 million iPhones in India during calendar Q4, and agreed that Apple is on track to report its best iPhone sales quarter ever. Apple will report its earnings after the bell on Tuesday, Jan. 27, when it will reveal how many iPhones were actually sold during calendar Q4.